For some reason, Superman's shadow keeps falling on Supergirl, and in Fight or Flight, the third episode from the debut season, it quite literally falls on her. Fight or Flight tackles the burden of legacy: the family legacy of the Supers, the legacy of past actions, and the burdens of reputation. Part of me wonders why Superman HAS to be a big thing on Supergirl, always haunting the series, as if the show is itching to put him into the series. Curiously, Fight or Flight makes The Man of Steel's presence (or lack thereof) part of the story, giving the Girl of Steel a chance to fight for a room of her own (thanks, Virginia). 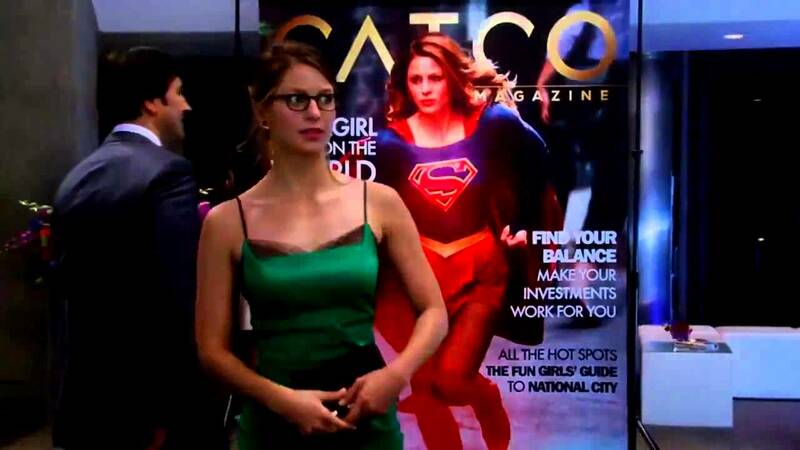 Supergirl/Kara Danvers (Melissa Benoist) has agreed to give an interview to Cat Grant (Calista Flockhart). She attempts to put things into perspective for our foul-tempered media tycoon, but Cat is having none of it. In her frustrations, Supergirl reveals that Superman is her cousin, and the aggressive Cat gets her scoop. Cat, with this info, decides to write a major expose on Supergirl, bemoaning the Millennials she sees Supergirl representing. Kara's sister Alex (Chyler Leigh) is unhappy about the cover story too, and more unhappy that Kara has an unofficial team with her: her unhappily platonic friend Winn (Jeremy Jordan) and hunky photographer James Olsen (Mehcad Brooks). More furious is Department of Extra-Normal Operations head Hank Henshaw (David Harewood), who snaps at Supergirl's new mass exposure. "What's next: a reality show? Keeping Up With the Kryptonians?!" he bellows. All this comes when we get a new threat: Reactron (Chris Browling), a name Olsen gave him back in Metropolis. A former foe of Superman, Reactron blames Supe for killing his wife and leaving him dependent on nuclear power to live when Superman stopped a nuclear reactor from exploding. James tells Supergirl that Reactron nearly killed Clark (thus revealing to a stoked Winn that Clark Kent IS Superman...nice job, JIMMY). James is worried Supergirl's lack of experience will leave her vulnerable, especially if she opts to rescue Maxwell Lord (guest star Peter Facinelli), industrialist who can help Reactron (real name Ben Krull) repair his suit. When she faces off against Reactron in her rescue of Lord, she is nearly killed until You-Know-Who shows up (in shadow, of course). "Supergirl embodies the worst traits of her generation: the earnestness without purpose, the unshakeable belief that she has a right to be heard...even when she has nothing to say". (For the record, as a proud GenXer myself, I wholly agree with Cat's statement on the generation following me). Supergirl is most upset however, that Superman showed up at the behest of James, who called him in. Supergirl is adamant about doing things on her own, without Superman jumping in to get her out of trouble. She essentially is determined to fly her own path. 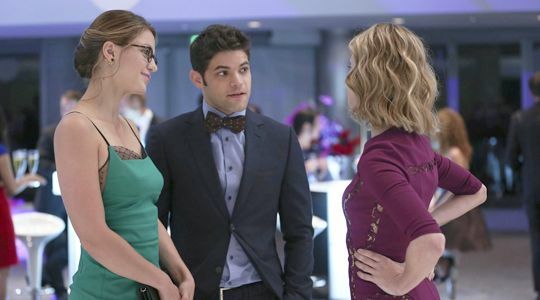 At the party for the Supergirl edition of the magazine, Winn continues to basically openly pine for an oblivious Kara (he loves her even before she was Supergirl) while she continues to waver over James (whom she mends fences with). Meanwhile, Maxwell and Cat appear to have something going on (or at least in the past, and maybe the future), but no time for romance: Reactron appears to take down Supergirl as payback for what her cousin did to him and his wife. With a little help from James, Supergirl is able to stop Reactron (saving both Winn and Lord again, with the latter hopefully more appreciative). In the end, things get more complicated with the appearance of Lucy Lane (Jenna Dawan Tatum, wife of professional stripper Channing), with whom James had a relationship and looks to be interested in reviving here in National City. Kara gets a text from Clark, telling her that he won't interfere again and congratulating her for defeating Reactron (something he wasn't able to do, thanks to the combined efforts of Alex and Hank). This was a job for Supergirl. On the home front, Alex and Kara make up as well, proving that family relationships are sometimes harder than super-villains. I found part of my shall we say frustration regarding Supergirl stems from the 'freak of the week' style that it's adopting. This was an issue with the first season of Smallville (at least the parts I remember of the only season I watched of a show I thought should not have run ten seasons). It was also a bit of an issue with the first season of Gotham (which the show corrected in its stronger second season). I am speculating, but I think that I will find this issue again when I finally get to Season One of The Flash (and I understand there will be a crossover between the two, something I find most curious). Actually, I sense The Flash will be more organized, though the first version of The Flash did have that problem. Would it have REALLY killed Supergirl to have had Reactron be more recurring? Are we going to have a real threat slowly emerge (unless that threat is Maxwell Lord)? I know there's Aunt Astra, but even then, we had Supergirl meet the villain, they fight, she wins after stumbling, and there you go. I'm not going to say after three episodes that Supergirl is getting repetitive or losing direction, but I do wonder why we keep getting pretty much the same thing three times (a bit Rubio-esque, sorry Marco). However, Fight or Flight has a lot more positive going for it than negative. Metaphorically and literally, the long shadow of Superman on the series is finally dealt with. I never concerned myself with 'why and/or if Superman would appear' on Supergirl (I guess since he didn't in Supergirl: The Movie and I didn't give it much thought then either). The theme of Fight or Flight is that of Supergirl and Supergirl being able to stand on their own, and Benoist's speech about how she needs to do things on her own after her cousin saved her was excellent. In fact, Supergirl is really elevated by the cast, especially Benoist, who brings that mix of youthful enthusiasm and insecurity into focus. This Supergirl is not afraid, but she is also untested. She wants to contribute, but finds herself letting her eagerness trump her abilities. After three episodes I think we can safely say Benoist IS Supergirl in the same way Christopher Reeve IS Superman. For once, Jordan's Winn didn't strike me as a bit of a sad-sack, but as what a lot of viewers are: fanboys who thrill to discovering Superman's alter ego and in helping out the heroine. I actually liked Jordan here. That means that Brooks is still a bit of a puzzle (and the entire Lucy Lane love story isn't something I'm eager to explore). I also think I was wrong in dismissing Flockhart's Cat Grant so quickly despite the "Devil Wears Prada" approach the show took with her. Now we see her as not antagonistic just to be antagonistic, but as a shrewd thinker who wants to, in her own way, improve the lot for women. Whether she said it here or last episode, Grant is right: women do have to work twice as hard to prove they are half as good as the men. Grant's harsh manner now has a sharper focus: she doesn't want Supergirl to screw it up for women, but she can't decide whether the Girl of Steel can measure up. I'm also intrigued by two story threads coming around: the identity of Henshaw (those eyes!) and the Grant/Lord storyline. Just like my views on Flockhart are going up, so are mine on Facinelli as Lord, this billionaire science-mind who is I figure going to play a larger role than mere one or two-off guest star. While I may never truly forgive him for the Twilight series (excuse me, SAGA), Facinelli and Maxwell Lord are both starting to grow on me. I'm hoping both stories play out well in the future. I am on the whole pleased with what Supergirl has done so far. I'm hoping that we can eventually move away from there being one threat a week to slowly building up more of a major villain (be it Lord or Astra or even a combination). Things seem go be going well for Supergirl and Supergirl, and I hope things continue to get better.